As a young girl, my family and I spent Christmas Eve with the radio dialed into NPR listening to NORAD's tracking of Santa. Listening to the frequent updates only made the anticipation of Santa's arrival on Christmas morning that much more magical. Even though this dates me, the days of listening to this time-honored tradition on radio are long gone. Now you can track Santa on your mobile device or computer using Google Earth. It's a modern age, and Santa has kept up with the changing times. 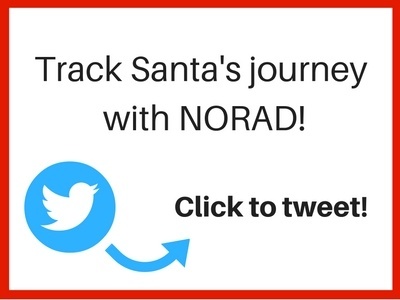 Gather the Kids and Visit the NORAD Tracks Santa Site! You can count down the days until Santa takes off from the North Pole, play interactive games, visit the "library" of Christmas stories, listen to Christmas music, or watch movies about Santa and NORAD. Even though my kids are too old to "believe," I know they will still have fun with a novelty that clearly never wears off. Obviously, it still entertains this grown-up kid! The history behind this tradition is heartwarming as well. Take a minute to see how our military members have been caring for the American citizens even during joyous times. I hope your family can enjoy the small joys of the season like mine always did. For over 60 years, NORAD and its predecessor, the Continental Air Defense Command (CONAD) have tracked Santa’s flight. The tradition began in 1955 after a Colorado Springs-based Sears Roebuck & Co. advertisement misprinted the telephone number for children to call Santa. Instead of reaching Santa, the phone number put kids through to the CONAD Commander-in-Chief's operations "hotline." The Director of Operations at the time, Colonel Harry Shoup, had his staff check the radar for indications of Santa making his way south from the North Pole. Children who called were given updates on his location, and a tradition was born. NORAD relies on volunteers to make the program possible. Each volunteer handles about 40 telephone calls per hour, and the team typically handles more than 12,000 e-mails and more than 70,000 telephone calls from more than two hundred countries and territories. Most of these contacts happen during the twenty-five hours from 2 a.m. on December 24 until 3 a.m. MST on December 25.